During freshman orientation, a group outside my dorm started chanting “no parents; no rules” incessantly at three in the morning. While this was incredibly annoying at the time, it perfectly captured the excitement you may be feeling right now. For many people, college is exciting and new! It’s also okay if you’re feeling a bit hesitant. Transitioning to college is unfamiliar, and for me, this provoked a lot of anxiety. Almost everyone has struggles adjusting in some capacity, but they’re expressed in a myriad of ways. My freshman year was also the point at which my mental health struggles began. I don’t say this to scare you; I say this because sometimes we don’t anticipate the changes in our lives that are coming. You’re about to have a lot more control and freedom over your life than you’ve likely ever experienced before regarding what you eat, if you go out or not, and more. I urge you to pay attention to how your body is feeling, as body and mind can be incredibly connected. If your body begins to feel sluggish from that soft-serve cone you’re having in the dining hall every day (I speak from experience! ), pay attention to your body’s natural signals. For me, college party culture also influenced how I was feeling on the weekends. If you want to go out, I encourage you to do so in a safe and healthy way. Binge drinking itself is a issue, and can also lead to academic and mood problems. Hangovers left me feeling horrible and also contributed to my stress about schoolwork. I know I may sound like your mom, but making smart choices about how you treat your body greatly impacts your college experience! 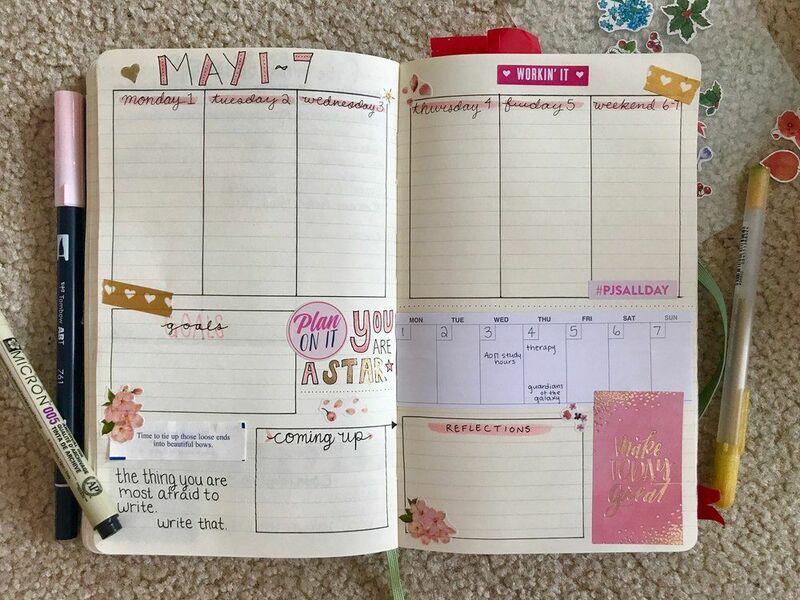 For me, self care is about organization and creativity! Here's my bullet journal from a few months ago. My friends always (jokingly) make fun of me for my strictly scheduled Google Calendar. Every second of my day is planned out because I’ve found this reduces my stress. Do what you need to in order to keep yourself feeling grounded. Self-care doesn’t always look like yoga, face-masks, or watching Netflix (though it 100% can!). I schedule “self-care time” in my calendar to make sure I take care of my mind. For me, this includes breathing meditations, journaling, cleaning my room, and taking my medications. If you start feeling down, you’re not going to want to do the research that you’re more able to do when you’re feeling mentally healthy. 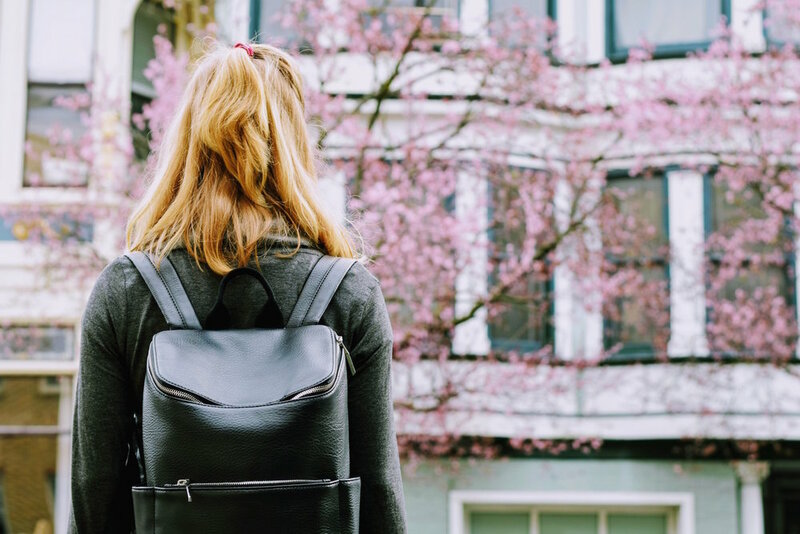 Look into your options now; many universities offer free individual counseling and support groups, psychiatric services, specialty housing, and mental health hotlines. Availability, accessibility, and cost can vary, so check that your health insurance or university covers fees for on-campus services. Otherwise, know that you can look off campus for resources. Major cities have a number of mental health centers, and you can always ask your school’s health center for referrals. If you’re in Massachusetts or Rhode Island, check out Zencare.co (the website you’re on!). Regardless of your location, hotline support is always available. The number for the US Suicide Hotline (which you can call with any mental health emergency) is 1-800-273-8255. When my little cousin died in the first week of my freshman year, I was lucky enough to have an old friend in the same city who brought me donuts and cried on the quad with me. Don’t lose these valued relationships if you have them. But I was also incredibly lucky to have the beginnings of friendships in my hall, and people who stepped up to help me in my time of need with company in the dining hall, tissues, hugs, and a listening ear. Invest in people with whom you can build healthy relationships: people who support you and make you happy. I recommend checking out clubs that suit your interests, or activities you want to get involved in with your hallmates and people in your classes. It’s okay to ask a few people in your lecture hall to make a study group on the first day. It’s okay to ask your hallmates to go to the dining hall or make ramen in your room. Invest in quality people, and they become your friends for the rest of college or even the rest of your life. This is a super generic statement, but it boils down to the sentiment that you are not the only one going through whatever you may be struggling with. Whether it’s a bad grade on your first assignment, finding balance between school and social life, or something more serious, there is always someone else going through something similar. Regardless of how it appears, everyone struggles with something freshman year. Everyone wants to look like they have it together. I promise, most of us don’t. You are not alone.